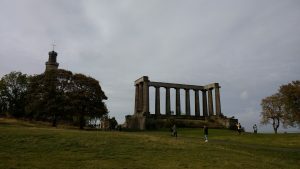 Last Thursday we headed up to Edinburgh for a long weekend. We had both been there a few times, but I think the last time I went I was still at uni, so a re-visit was long overdue. A few weeks ago Andy found a deal for first class train travel (which means bigger seats, a meal and drinks) for £30 each, which seemed like a bargain. We got the train from Kings Cross at 6pm, so spent the evening on the train, listening to the film podcast first, and then some others, before arriving after 11pm (the train got stuck behind a slower train after another train broke down and it had to take a different route, so it was a bit later than planned). We were planning on walking to our hotel as it was around a mile from the station but after walking a bit we ended up getting an uber. 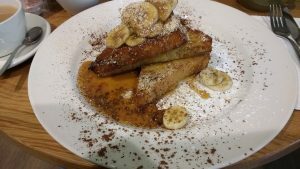 On Friday morning we went out for breakfast at this amazing bakery around the corner from our hotel (Loudon’s)- I was spoilt for choice but in the end went for French toast with bananas and salted caramel sauce. So delicious. Loose leaf tea in little tea pots too, which is always a winner in my book. Andy had gone for scrambled eggs (his usual) but even he was envious of my choice- it was such good bread (home-baked) and really thick slices- not soaked and not too eggy. It was massive though (not sure the photo really shows it) and so he ended up finishing it for me! Good fuel for walking around the town. 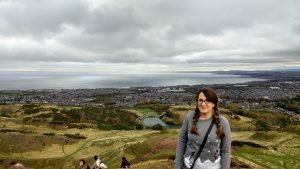 We walked along Princes Street (the main shopping street) and into a park at the end, up some steep steps for lovely views. 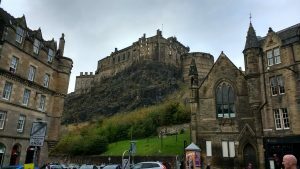 We then walked along the Royal Mile, past all of the very touristy shops, up to the castle. Andy wanted to go into the Whisky experience, so we booked tickets for later that afternoon. We were both so full from breakfast so we shared a salad, before heading inside to warm up. 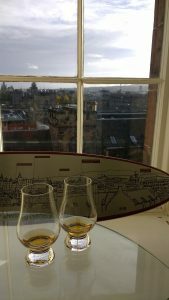 The tour was actually quite interesting, and we got to see the thousands of varieties made in Scotland. Each ticket also got you two samples- we did ask if they did a cheaper one without, as I wouldn’t drink them, and they told us I could have Irn Bru instead- sorry Scotland but I’ll pass on that. Andy had mine! The seating area had great views too, and a map to show what you were actually looking at too. We then walked back along the main streets, before heading for an early dinner close to our hotel. 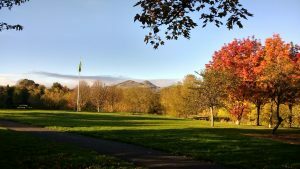 On Saturday morning I was off for my parkrun tourism. I was very glad of uber as I am not sure I would have managed to navigate the buses. However there were not that many around so I had to wait about 10 minutes at the end before one came- if I had realised that I would have booked one and then stretched and taken photos, whereas I waited until I had done all of that before booking it. Ah well. 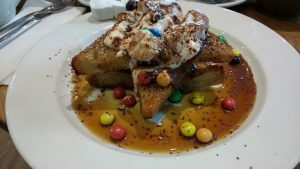 We headed to Loudon’s again, and I was going to have the blueberry pancakes, but then they said they were doing a Halloween special- French toast with nutella, banana creme fraiche, caramel sauce and m&m’s- I could not resist that! It also came with various jelly sweets which I asked to be left off because of the gelatin. I was so full after that! 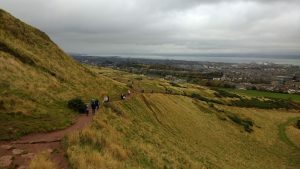 We needed a big breakfast as we were walking up Arthur’s Seat (and walking to the bottom from our hotel). 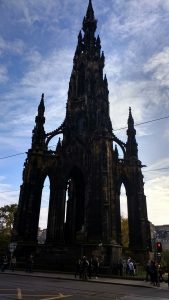 There are some museums in Edinburgh but we were saving those for if it rained- not this time luckily. I even took my coat off as we were walking up as I got so hot. I soon put it back on again as the wind was very cold. We had lovely views across to the park we went to on the Friday- it also showed us how far we had yet to walk as we were going back to the centre after. We didn’t need lunch of course, but we stopped for a cup of tea to warm up for a bit, and sat in the park with lovely views. 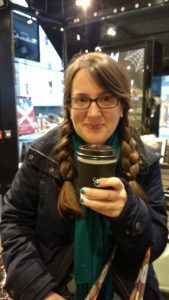 On our way past Hotel Chocolat we saw a sign that advertised a seasonal special (the shop had a cafe in the back)- spiced hot chocolate with salted caramel (or something, I can’t quite remember). I could not resist that so we shared one of those- it was so good. Then it was time for dinner- we were both pretty shattered after all of that walking. 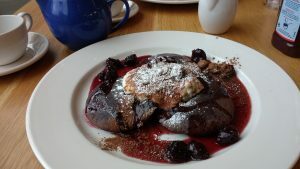 On Sunday we were up early as we had to get the train back at 12.00- this time I had the blueberry pancakes (they were actually purple!) which I think came with banana and cherries. Of course it was delicious. We then walked into the centre and wandered around the town a bit. Annoyingly my back was really sore when I woke up, and so I was walking fairly slowly and not looking forward to sitting down all afternoon on the train. Going back down in the light was great, particularly further north as the train tracks were right by the coast. We saw lovely views, and mostly listened to more podcasts- really relaxing. 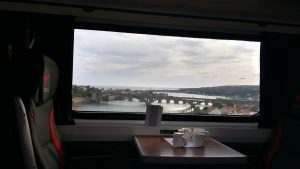 It was a great place to visit, and we are already looking at where else we can get to by train- Durham always looks great and the line goes through there so that might be next. 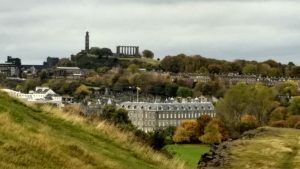 Have you ever been to Edinburgh? What type of city break activities do you like to do?